Looking to have your students leap from the sidelines to participating in citizen science? To spring forward from awareness to action? 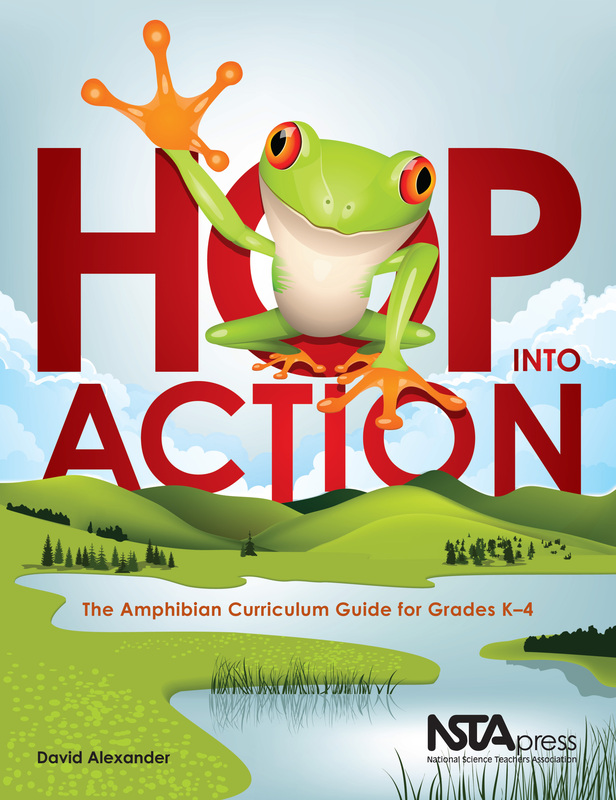 David Alexander’s fun and easy-to-follow curriculum guide Hop Into Action [NSTA Press, 2010] is a fantastic way for educators, youth leaders, and naturalists to become informed and involved with frogs, salamanders, and other amphibians. Alexander leaves virtually no stone [or log] unturned, approaching the subject from nearly all angles, and all disciplines. He provides information on the ethical, practical, and logistical considerations for the field and the classroom, from handling techniques to finding or creating an appropriate amphibian habitat. There is an extensive resource list of related age-appropriate books and materials, a thorough glossary and index which is immensely helpful for building science vocabulary, and an elaborate matrix correlating the 20 activities to the North American Association for Environmental Education [NAAEE] Guidelines for grades K-4. Alexander also offers ways to adapt the lessons for our youngest naturalists. Alexander’s 20 activities are clearly written, require few additional materials [which are easy and inexpensive to obtain] and easy to follow. A friendly frog appears on the introductory page of each activity. This familiar character instantly welcomes you to each lesson, dressed and posed to provide a quick and amusing introduction. From artist to businessman, from diner to singer, our multi-faceted guide is a welcoming host and reflects how enjoyable and interdisciplinary the guide is. The clear illustrations and clever comparisons [i.e., comparing the size of a frog to a tennis ball] make both teacher and student more comfortable with measurement and help both ease into scientific procedures. Alexander also offer fresh approaches to familiar activities [i.e., “Lily Pad Venn Diagrams”] and fun, modern ways of expressing and exploring ideas, such as “Herp, Herp Hooray” [amphibian conservation plans] and “Frog Pond Lifeguard” [aquatic invertebrate survey and ecological health assessment. With nearly 1/3 of amphibian species known to be threatened or extinct, and at least 42% of amphibian species declining in population for reasons such as habitat loss, climate change, and fungal disease, according to the 2008 Global Amphibian Assessment […], it is important to guide children to understand and appreciate amphibians before it is too late. It also provides an opportunity for students to connect to a global extinction issue closer to home, using species they can observe nearby. Hop Into Action is a fantastic vehicle for getting elementary school teachers more comfortable with and involved in science. It is also a convenient reference and source of activities for camps, youth groups, nature centers, and other non-formal settings. Its lessons can be used individually, as a building block for a unit, or a foundation for a year-long investigation. Hop Into Action also makes a fantastic gift for the educators in your life, and is truly a gift to amphibians everywhere.